About a week ago, when I realized that this pi day would be a once in a century pi day, I said “Wouldn’t it be nice if we held a pi day themed dinner, but I’m sure it’s too late to get people together.” To which my husband replied “Why not? Let’s do it!” So yesterday morning I donned a workhorse apron, given by a lifelong kindred spirit, and started making pies. One of my many workhorse aprons with necessary pockets, stains, and singes. Badges of honor. One was for the pi day celebration at the public library. Just like me, the librarians were energized by my husband’s ideas when he asked if they were doing a pi day event. At the time they didn’t have anything planned. That was just over a week ago. By the next time I stopped in to drop off books they had a program sorted out and ready to go; as far as I could tell it mostly involved eating pie. The top left pan held the peach pie, the right pan was for the butternut squash, and the bottom left held the buttermilk lemon pie. 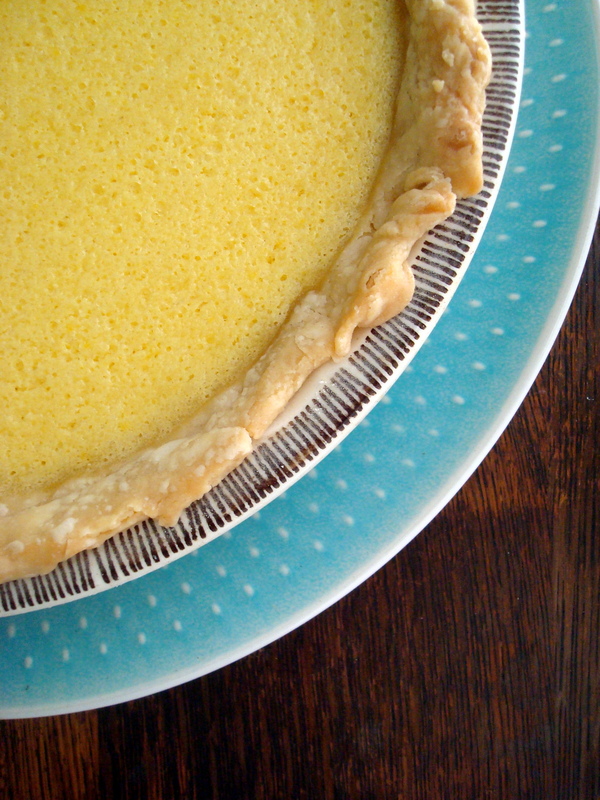 This Old Fashioned Buttermilk Lemon Pie was my library pie. Having never tasted a buttermilk pie before, I still had high hopes since custard type pies tend to be my favorite. It exceeded expectation with a tangy frothy custard completed by a lightly lemony touch. I like lemon pies, but often the citrus is too overpowering; this one was perfect. A lady who asked for the recipe (which I was able to recall and write down for her from memory. Take that mommy brain!) compared it to lemon bars though this was significantly easier to make than lemon bars. Next time I will dust the top of the cooled pie with powdered sugar. Have I mentioned how much we love our library? They save all their newspapers for our garden, it is an outlet for our daughter during the endless cold winter months, and some of our best friendships were forged at there. The other two pies were for our pi day themed dinner party we hosted with two other families (whom we met at the library). To ensure we had a proper spread, each family contributed a savory pie as well as a sweet one. I made a tried and true family favorite, Butternut Squash with Caramelized Onion Pie (the recipe title says tart, but since I’m putting it in a pie pan instead of a tart pan that makes it a pie, right?) and the experiment was this Coconut Almond Peach Pie. I followed the recipe exactly for the buttermilk pie but for the peach pie I did a few little twists. I used whole almonds, 1/4 plain roasted and 1/4 smoked ground in my food processor, and also put in a few scant drops of almond extract along with the vanilla extract. The almond extract was a little too strong, next time if I have amaretto on hand I will use a splash of that instead. This was my grandmother’s pie dish. It has lived through a few generations of pie making and still produces perfectly golden crusts. For the crust I used my mom’s never fail pie crust. It’s in the family cookbook. In my rebellious youth I tried a few other recipes and they all failed, but this one has stood the test of time to produce supple dough which transforms into flaky buttery crusts in the oven. Even the Cook’s Illustrated pie crust recipe falls short *gasp* when compared to my mom’s recipe. The chicken pot pie in the shape of pi. So clever and delicious. When I got a text that they were on their way I had to accept that the butternut squash pie, which was still just a crust in the pan and filling in the bowl, would not be done by the time they arrived. I took a minute to finally put baby down, swapped out my workhorse apron for a hostess apron, and…Wait, what? You mean you don’t categorize your aprons by which ones have taken the heat and have the scorch marks to prove it vs. the ones you keep nicely pressed and ready for company? Oh, you do, good. For a second there I thought we’d have to sort that out for you. This apron is also a gift from another soul shaping, story sharing, lifelong friend. It is one of those sweet, impractical frilly aprons that can cover up baby urps or crusty dried snot from a toddler hug. In addition to my contributions, the feast included a macaroni pie with smoked paprika, a gooey savory sausage and cheese calzone thing in the shape of pi and a chicken pot pie wrapped in filo dough also in the shape of pi. It was obvious that everyone had their fill and then some. For dessert there was a heavenly blueberry custardy pie topped with pecans, cow pies, salted caramel oatmeal cookie pies, the peach pie, and two pies from the library event – the buttermilk pie and a salted caramel pie with mounds of real whipped cream. The adults then played Puerto Rico while the kids played dress up. As everyone prepared to head home there was swapping of left over pie and promises for shared recipes. 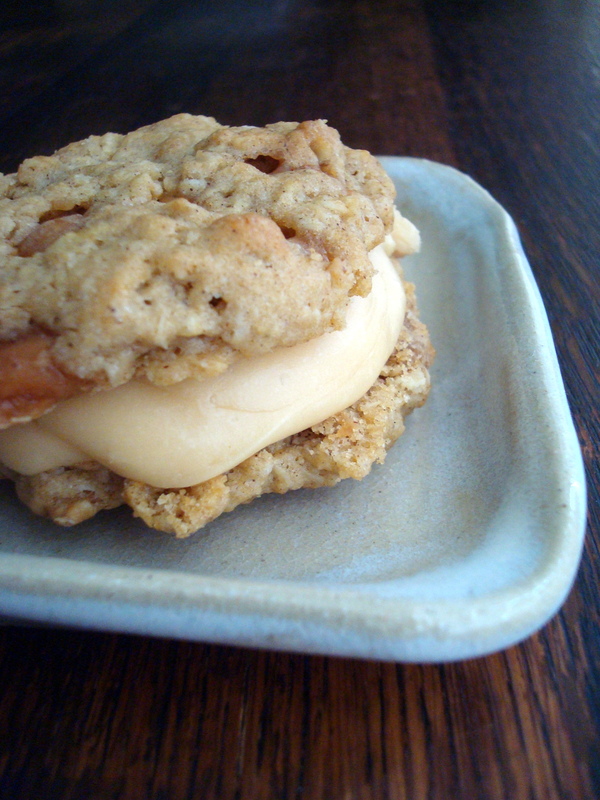 I snapped a few pictures of this salted caramel oatmeal pie cookie right before I ate it this morning alongside a cup of tea. Oh the ooey chewy goodness. I am already looking forward to future dinner and game nights with these delightful friends. Yet another memory day thanks to my husband’s unfailing optimism. Who knows what we will do next. Manatee-assisted aquatic therapy? A complete cat-bus costume for Dellabug? Growing a public food forest in our tiny rural town? Sure, why not. Let’s do it! I adore this…and you…and that enthusiastically wonderful singing hubby of yours! Mmmmm-mmmmm!